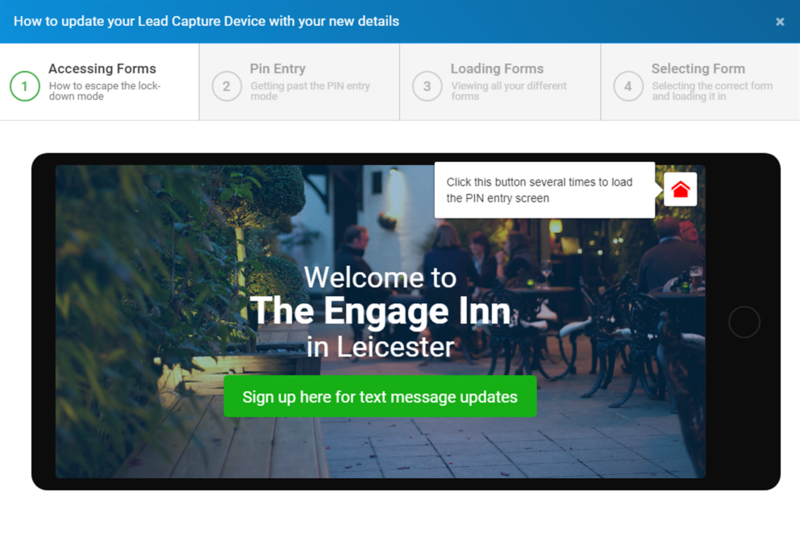 If you are using the customer sign up app (EngageInn) you can edit the details of the form and the screens that are displayed on the tablet. 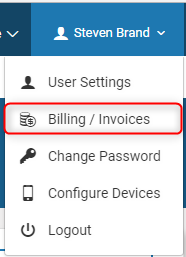 Navigate to the billing area by using the dropdown menu that is located under your name in the top right of the screen. 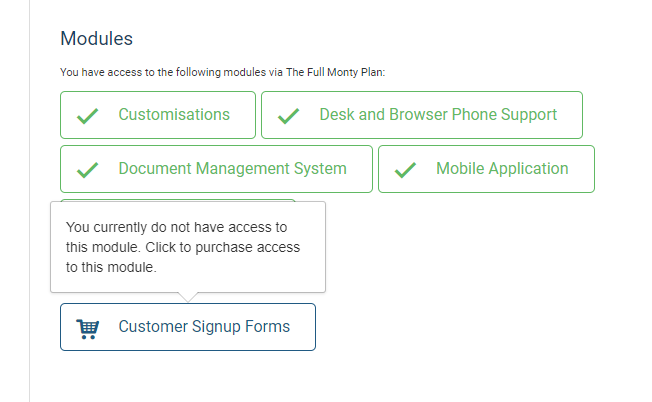 In the 'Modules' area towards the bottom of the page select the 'Customer Signup' module. Confirm via the next window that opens that you wish to start using the Customer Sign up form and you will be good to go! 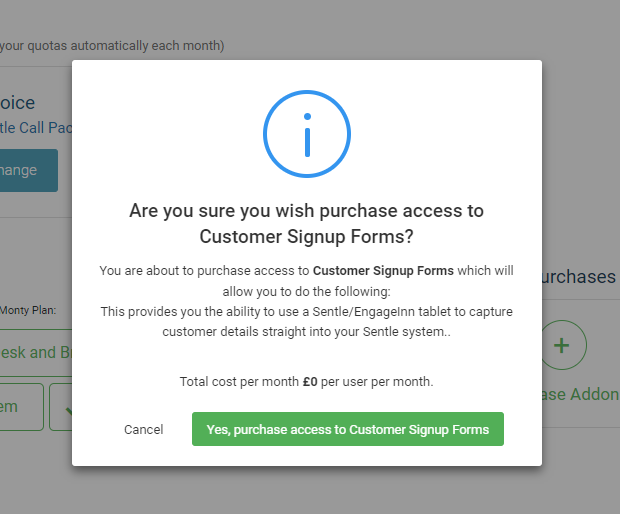 Select the 'customer sign up' tab from with Sentle CRM and you'll be able to start editing the data included on the sign up form. Title: Create a title for this form so you can review and edit once created. This will not be displayed on the app but will be for your reference only. Welcome Text: This is the text that will sit in the centre of the screen. 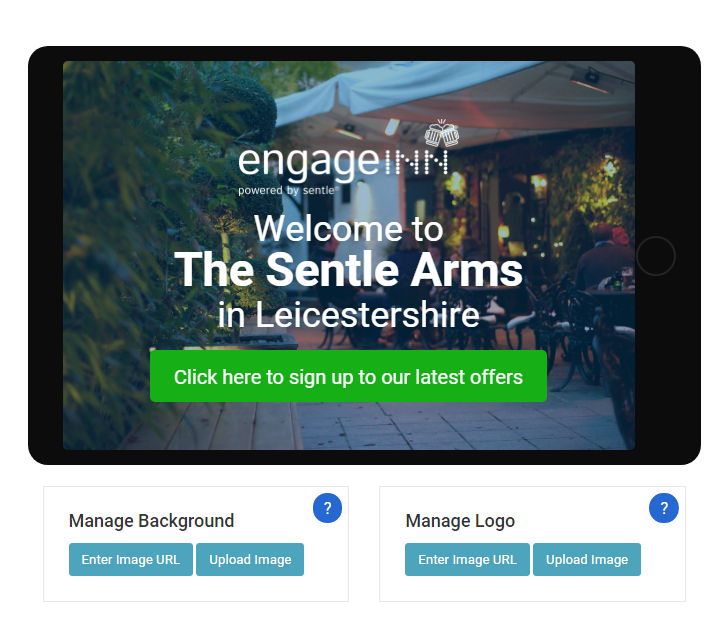 In this case ‘Welcome to the Sentle Arms in Leicestershire’ with ‘The Sentle Arms’ in bold by highlighting and pressing the B above. Button Text: The text here is what will be displayed on the green button used by your customers to sign into the system. Edit the text to see it change in real time. Information Page Text: Enter text here that will be displayed on the information tags page. This should be instructional to guide your customers to choose the areas of information they will be interested in being kept up to date with. Associated Tag: This is the tag that will be automatically added to the customer when they sign up through the app, such as ‘Front Bar’ or ‘Restaurant’ etc. Essentially this will give you the ability to attain a good view as to where your customers have signed up. Welcome Text Message: This is the text message that will be sent to customers when they sign up for your news via the system. A separate guide on creating SMS message templates can be found here. Do you wish to collect Email Addresses as well as Mobile Numbers? : As this suggests, you are able to configure the customer data form to capture emails addresses as well as mobile numbers. Simply select the option you require from the drop-down menu. Uploading a background image and logo. You can change the background image and logo that is displayed on the tablet by using the image manager as shown here. Hover over the question marks of both image type to see the optimal resolution (in pixels) for each image. You can either select to upload the image file or use a URL if the image is hosted elsewhere. 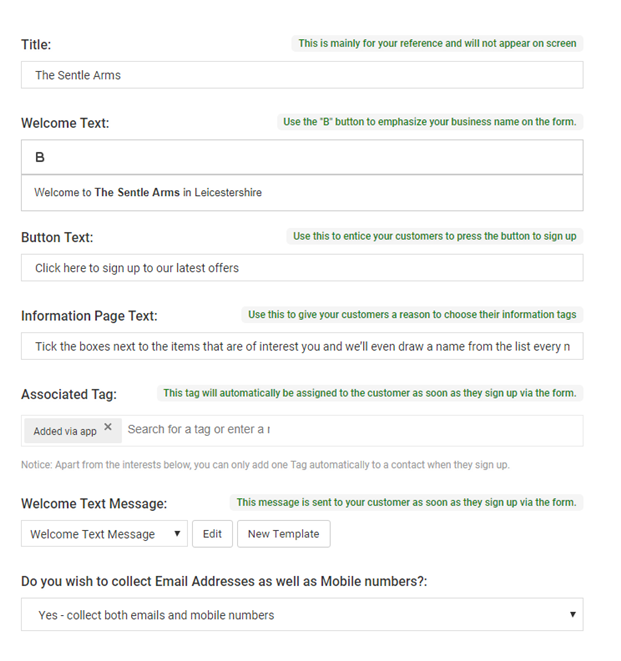 Before your customers can add their details to your system you will need to add some information tags that they can choose when signing up. We recommend choosing an even number as they look better on the screen and keeping them simple! Having a total of 8 information tags seems to fit well. What you add is up to you and totally dependent on your business activities so things like ‘Food Offers’, ‘Guest Ales’, ‘Quiz Nights’ etc. Click ‘add information tag’ to choose on the tags set up in your system to apply to the app. If you need to create a new one use the ‘shortcut to tag editor’ button and add the tag there. When you go to add the tag to the app the system will ask you to add a ‘Friendly Name’ which is essentially how it will appear on the app. This could be exactly the same as the tag name itself but this is entirely up to you. When tags are added the screen will adjust to show how they’ll be displayed on the form. When the tablet is not in use it will begin to show images where you can weekly updates, new offers etc to be displayed to your customers. Follow the on-screen instructions to select images you want to use on the screens and they will be shown in the editor. Once you are happy with the details you have added to your app screen you are now in the position to add them to your tablet device. You’ll see ‘How do I update my device’ in the top right-hand side of this screen. Selecting this will the following screen. The instructions shown here should be carried out on your tablet. Once complete your tablet will be updated with your new details!